Sept. 5, 2017 | Sept. 5, 2017 | A nationally funded research center that was created to help the University of Arkansas for Medical Sciences (UAMS) grow its research enterprise has helped UAMS researchers successfully compete for grants totaling more than $100 million in just 13 years. UAMS is reaping the rewards of its first Center of Biomedical Research Excellence (COBRE) award. It funds UAMS’ Center for Translational Neuroscience (CTN), now in its third and final phase of funding. 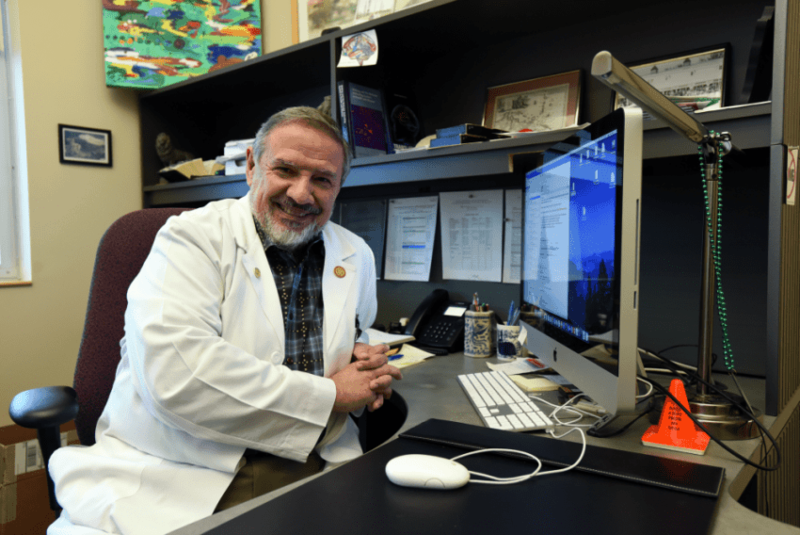 Led by Edgar Garcia-Rill, Ph.D., the CTN has benefited UAMS’ research enterprise in many ways since it was first funded in 2004, said Lawrence Cornett, Ph.D., UAMS vice chancellor for research. Phase I, $7.5 million, 2004-2009. CTN activities included bringing established, nationally funded researchers to UAMS who could mentor early-career researchers; and support to help early-career researchers at UAMS and Arkansas Children’s Research Institute reach independent status with their own national funding awards. Phase II, $7.5 million, 2009-2014. More mature programs were supported along with collaborations between clinical and basic scientists. Investments in these efforts helped increase grant support at UAMS by more than $33 million. Phase III, $3.5 million, 2014-2019. The CTN has focused on helping UAMS successfully compete for large-scale research programs, such as additional COBREs and Centers. CTN investigators have generated over 550 articles and chapters, averaging more than 40 per year over the last 13 years. The CTN was designed to benefit a wide range of research at UAMS, from studies in the laboratory to studies that involve human participants. The success of the CTN started early, Garcia-Rill said, and is a credit to the researchers who received funding support and to the CTN external advisory committee that identified them. As just one of many examples, he cited Mary Aitken, M.D., a professor of pediatrics and injury prevention researcher in the College of Medicine. IDeA States Pediatric Clinical Trial Network (ISPCTN) Data Coordinating and Operations Center, $41.8 million, led by UAMS’ Charlotte Hobbs, M.D., Ph.D., the College of Medicine executive associate dean for clinical and translational research and the Pamela D. Stephens Professor of Birth Defects Research; and Jeannette Lee, Ph.D., professor of biostatistics in the College of Medicine. Center for Translational Pediatric Research, $11.5 million, led by UAMS’ Alan Tackett, Ph.D., Scharlau Family Endowed Professor of Cancer Research and a professor of biochemistry, pediatrics and pathology. Center for Studies of Host Response to Cancer Therapy, $10.5 million, led by UAMS’ Martin Hauer-Jensen, M.D., Ph.D., professor of pharmaceutical sciences, surgery and pathology. The CTN can claim a number of achievements, possibly its biggest being the reduction in infant mortality in Arkansas. The CTN’s COBRE-supported telemedicine program, Pediatric Physician Learning and Collaborative Education (Peds PLACE), led by pediatrics professor Whit Hall, M.D., connects UAMS neonatologists such as Hall with physicians caring for newborns in hospital nurseries across the state. In 2006, 8.5 of 1,000 newborns died in Arkansas. Since then, the rate has fallen to 6.8 per 1,000, with the biggest improvement among African-Americans. That equates to saving about 60 babies a year, Garcia-Rill said. The success of Peds PLACE recently led to additional federal funding that will allow the program to expand into Oklahoma, where five telemedicine units will be placed in hospitals that serve American Indians, a population with high infant mortality rates.